UAE, Dubai 16 April 2016 – Sobha Group, the leading luxury real estate developer, has announced the launch of Sobha Hartland Greens, a luxury building with unrivalled cityside living in its urban mixed-use waterfront development in the epicentre of Dubai. The eight-storey residential project at Sobha Hartland in Mohammed Bin Rashid Al Maktoum City, is beautifully set within a three km radius to the city’s main attractions. 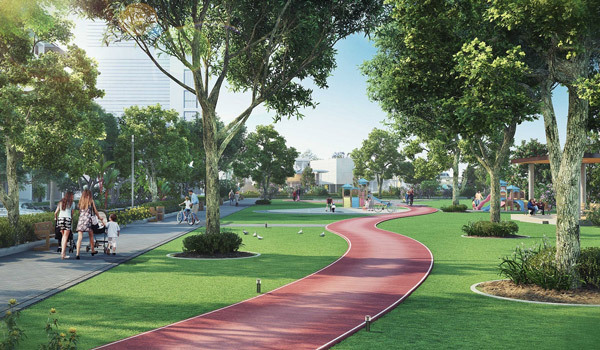 Residents will also have easy access to restaurants and entertainment facilities within the community. Sobha Hartland Greens includes eight floors of residential apartments varying from studios, to one, two and three bedrooms. The luxury apartments start with an attractive price from AED 804,000 with exceptional payment plans on offer. The handover of units will start from December 2017. Encompassed in the development will be two international schools, one currently in operation, nurseries, malls, cafes, tennis courts, yoga centre, swimming pool, clubhouses and spa’s, mosques and healthcare facilities. Residents will also be three kms to various attractions across Dubai such as :to the tallest tower in the world, the largest mall in Dubai, Meydan Racecourse; home to the world’s richest horse race, District One 8.4KM cycling and jogging track, Dubai International Financial Centre, Water fountain’s, world’s longest indoor ski slope, Dubai Country Club, Dubai Equestrian Centre, Dubai One Tower; World’s tallest residential tower and Ras Al Khor Wildlife sanctuary. They will also have easy access to the Dubai Canal and Metro, both of which will envelope Hartland’s low density environment.